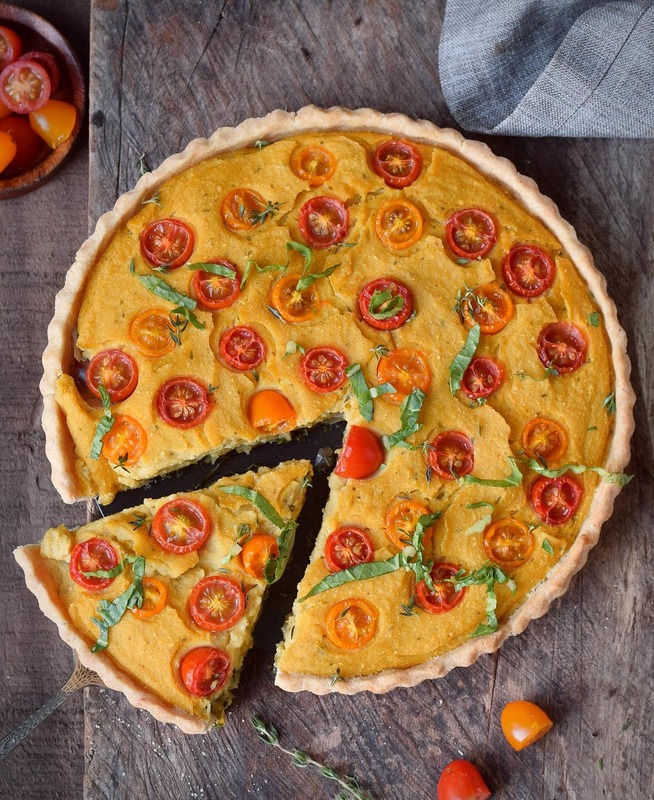 This quiche with a decadent pie crust and healthy veggies is a winner in my book. The best part is that it’s soy-free and completely egg-free. You probably know how many eggs a normal quiche contains. Plenty… Most recipes I found online contain 6 large eggs… But not this one. 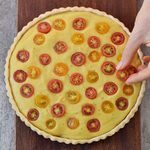 This vegan quiche with a gluten-free pie crust is free of cholesterol and it still tastes heavenly. Don’t believe me? Try it out. I’ve used the veggies which you can see in the photo above. I was actually going to use fresh mushrooms as well but then sadly found out that I don’t have any in the fridge. And I didn’t want to use canned ones (or go to the store), that’s why this recipe turned out to be mushroom-free. However, if you love mushrooms (as much as I do) then definitely add them. If you don’t like any of the veggies which I used, simply leave them out. 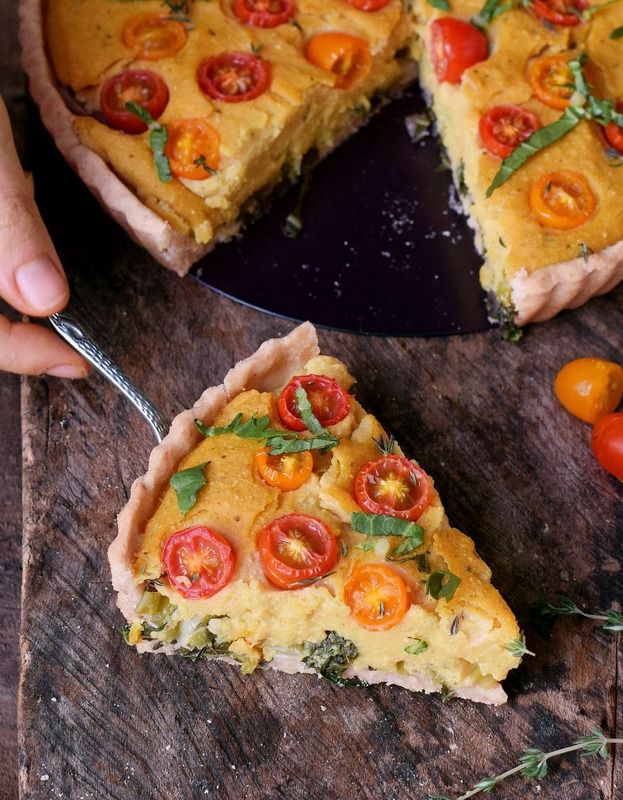 You can add any of your favorite veggies to your vegan quiche, feel free to experiment. 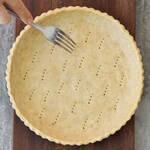 You can use a store-bought pie crust for this recipe but I normally always make all my recipes from scratch. This gluten-free pie crust is very easy to make and most likely much healthier than any store-bought pie crust. It can be easily made nut-free. Check the recipe notes below to find out how. The great thing about quiche is that it tastes awesome when it’s warm but also very good when it’s cold. I really don’t know what I prefer more. You can take it to work, uni or school, it’s really great for meal-prep! 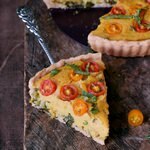 How to make a vegan quiche which has almost the same texture as regular quiche without eggs? The secret ingredient is chickpea flour, also known as garbanzo bean flour or besan flour. 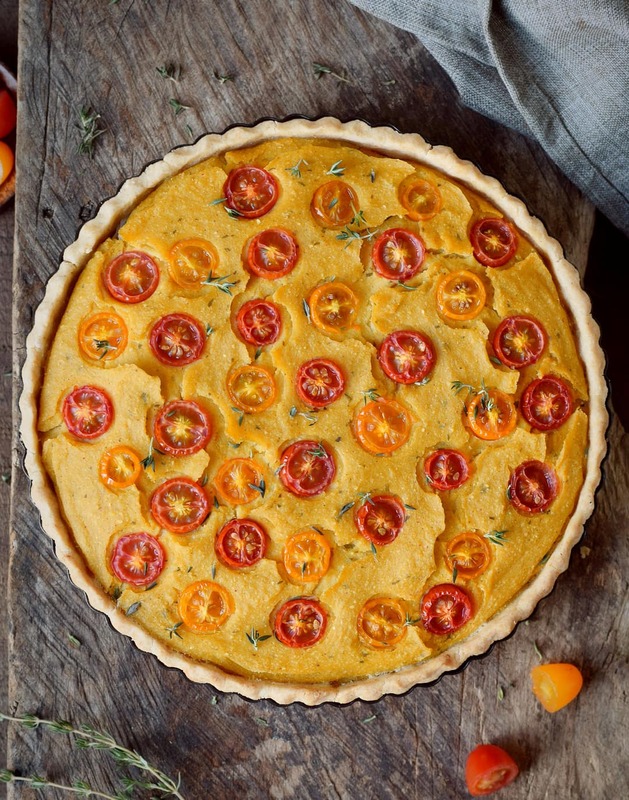 I really like chickpea flour, it’s gluten-free, high in protein and so versatile. 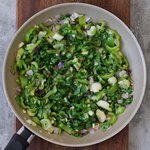 I love using it for my gluten-free tortillas which are very popular on my blog. 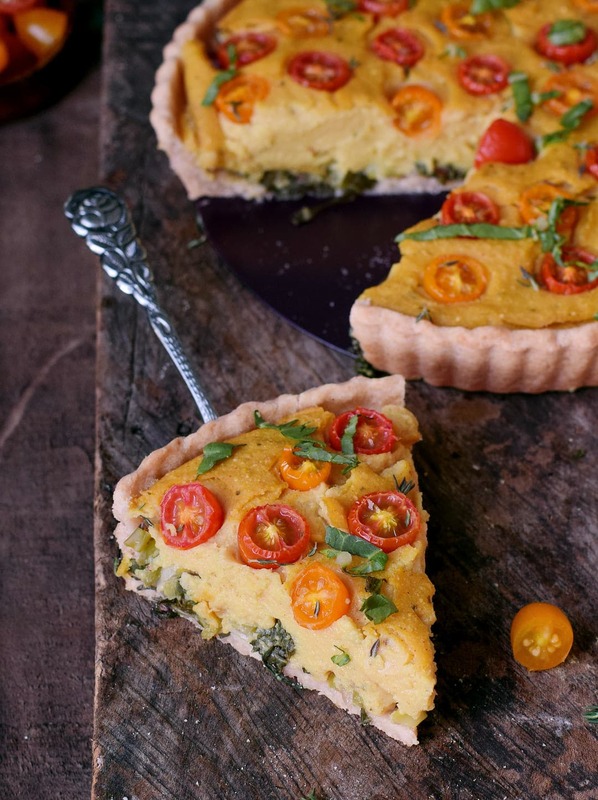 Also, there is no need to use tofu for this quiche, it turns out amazing without soy! I learned on Mary’s Kitchen blog (https://marystestkitchen.com) that cooking the chickpea batter for 5 minutes will make a difference, tastewise and texturewise. It’s an amazing tip and I am grateful for her inspiration! If you give this recipe a try, please leave a comment below and don’t forget to tag @elavegan #elavegan on Instagram or Facebook if you take a picture of your dish. 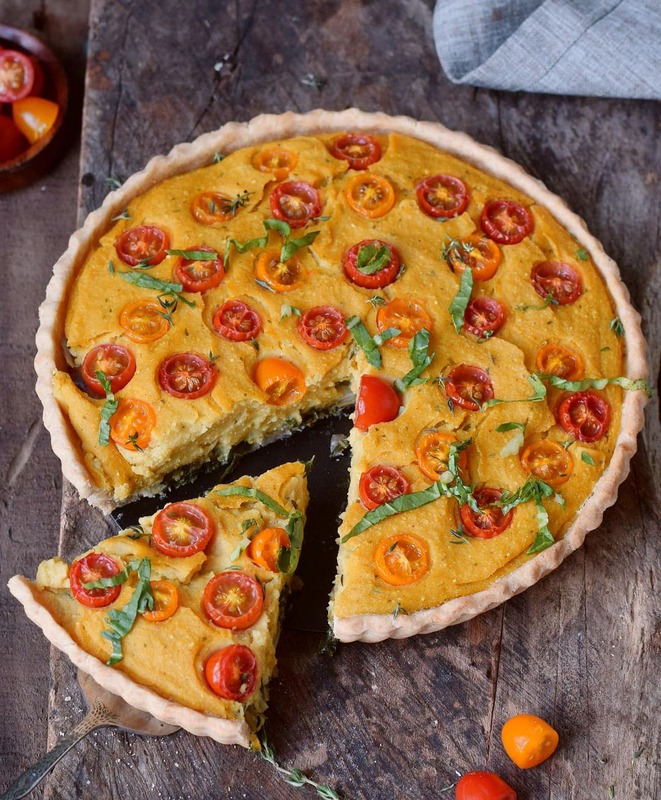 This delicious vegan quiche recipe is a great comfort dish which is not only plant-based but also gluten-free. 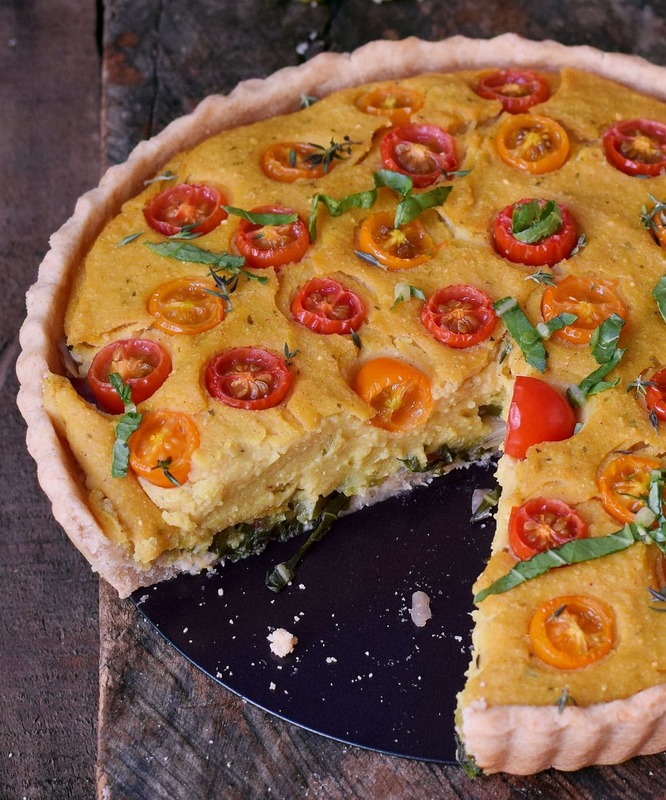 The egg-free quiche is also soy-free and can be made nut-free! To make the flax egg, put 1 tbsp ground flax seeds to a small bowl, add 3 tbsp water and mix with a whisk. Set aside for 5 minutes. Now transfer all ingredients for the pie crust to a food processor and blend until the dough clumps together. 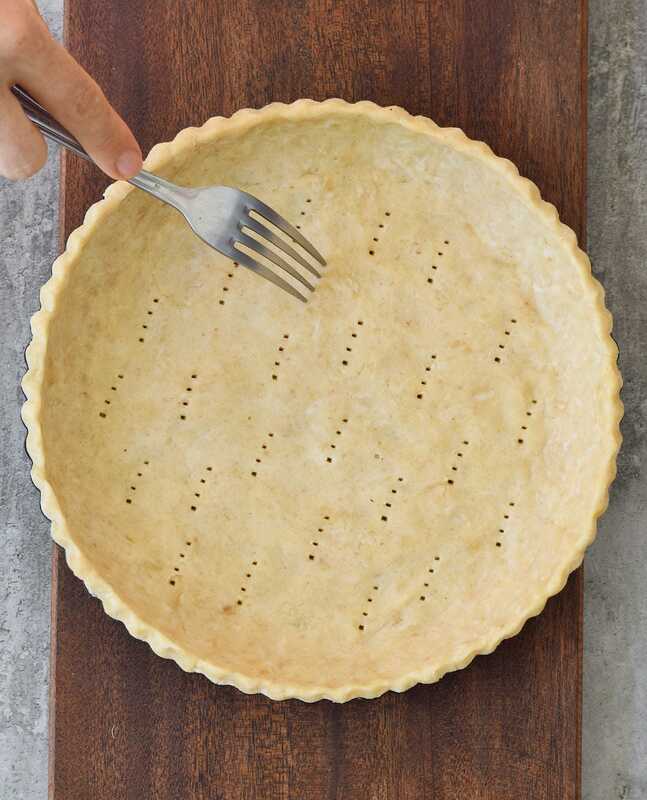 If you don't have a food processor, simply add all ingredients for the pie crust in a bowl and use your hands to knead the dough until it clumps together. If the dough appears too dry add a tiny bit of cold water. With the flour blend which I am using (see recipe notes) no water is needed! Roll the dough into a ball, wrap it in plastic wrap and place it into the fridge. Refrigerate for about 30 minutes. After 30 minutes, remove the dough from the fridge. Roll it out to fit the bottom of an 8 or 9-inch pie pan. Press it into the pan and about 2 inches (5 cm) up the sides. Put it back into the fridge. 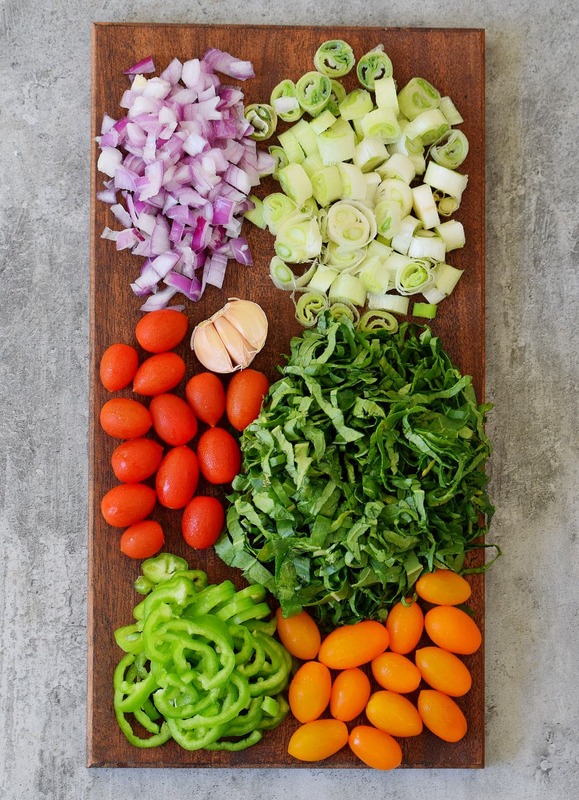 While the dough rests in the fridge, you can prepare the veggies. Heat a little bit of vegetable oil in a saucepan, add the onion and fry over medium heat for about 1 minute. Add garlic, pepper, leek, spinach, and a pinch of salt. Sauté for a few minutes until all the water evaporates. Let cool. If there is still water left, then squeeze it out as much as possible. Preheat oven to 430 degrees F (220 degrees C). In a bowl mix the chickpea flour, 1 cup of plant-based milk or water and the spice mix with a whisk. 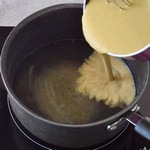 In a saucepan bring two cups of vegetable broth (or water) to a boil. As soon as it boils, slowly pour the chickpea mixture into the broth while stirring. Let simmer on low heat for 5-6 minutes and make sure to keep whisking frequently. It will get quite thick which is normal. Add sautéed veggies into the bottom of the pie pan. Now pour in the chickpea batter on top of the veggies and add the halved cherry tomatoes on top. Bake in the oven for 25-30 minutes. It's best to let the quiche cool completely (preferably in the fridge) to set. It can be served cold or warm (you can heat it up in the microwave or in the oven). Garnish with fresh thyme leaves or basil and sprinkle a pinch of black salt (kala namak) on top for an eggy taste. Enjoy! I've used the following gluten-free flour mix: 1/2 cup rice flour (80 g) and 1/2 cup tapioca flour (60 g). However, you can use 140 grams (about a cup) of 1 to 1 Bob’s Red Mill baking flour (gluten-free) instead. To make the recipe nut-free, you can use ground shredded unsweetened coconut or ground sunflower seeds instead of almond flour. You can use ground chia seeds instead of ground flax seeds. Hello Ela and thank you for the recipe! Because of my daughter’s allergies I can’t use vegan butter. Is olive oil a possible choice? Will it work? Thank you very much! What about thinly sliced sweet potatoes layered in the pan and overlapping a little. I have done this and once they cook they fuse and can be cut like pastry. Is there another flour I can sub for chick pea flour, with or without gluten? You could use polenta (cornflour). It should work the same! This vegan quiche looks so delicious, Ela! I love that it’s without tofu ❤️Will definitely try it! ???? Thank you very much, Bianca! I am glad you like it. ???? Yes, that should work without problems. Just make sure to put each piece into a ziplock bag. This filling looks epic Ela! 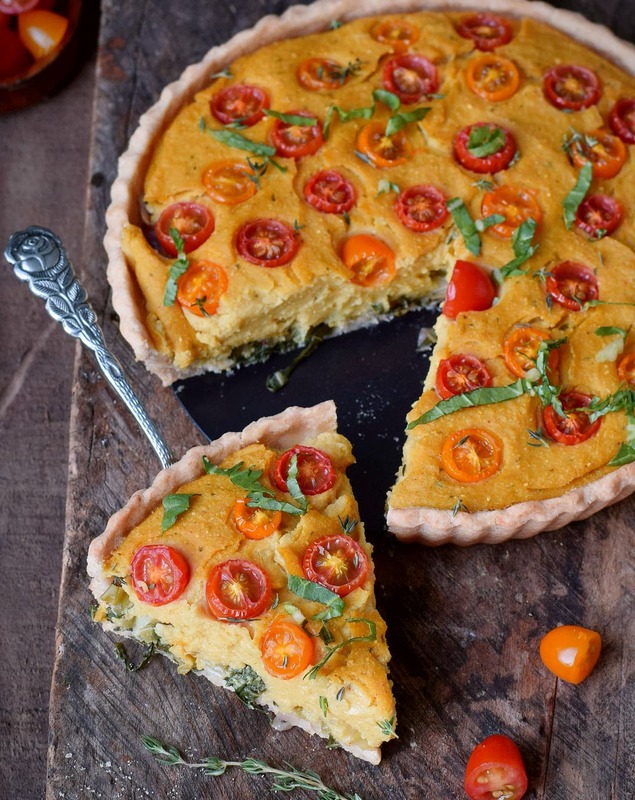 I’ve made chicpkpea flour omelettes but love the idea of chickpea base for a quiche! Hi! I made mini quiche cups with no crust and it worked great! I just mixed the veggies into the batter instead of layering them underneath to make sure they wouldn’t fall apart. Hi ???? I just want to thank you for this delicious recipe. I made it yesterday and my family ( they are not vegan like me ) but they loved it. I put the picture on Instagram and I tagged you. Love all your recipes. ???? I’m planing of doing it again but this time as a dessert. Maybe add some maple syrup to the crust and instead of veggies add apples and in the chickpea batter add cinnamon , stevia , brown sugar and maybe decorate it with some pecans ¿what do you think ? ???? I like your recipe and made it but substituted thinly sliced sweet potatoes for the crust. I thinly sliced them and overlapped them in the pie dish. Once baked they fused together and cut just like pastry. I made this to see if it’s something I want to bring to our family holiday party. Simple enough to follow. And tasted great. The only thing that happened was the garbanzo mixture did not mix with the vegies and i didn’t realize. So, it took longer to bake and was seprated. Next time I will be sure to mix the batter into vegie mixture. Thanks again. It should be a hit at the party. I’m on my second round of this great recipe! I’m definitely adding it to my arsenal, it didn’t last 24 hours in this house! This time around I’ll be adding the veggies into the batter, only because it fell apart a bit with all of the veggies on the bottom. I also found Kala namak at a nearby Indian grocer and I can’t believe it, most egg flavor I’ve gotten out of anything since going vegan. A little goes a LONG way, I used a tiny pinch in the batter and it was perfectly eggy! Is there any other gluten free flour I can use instead of rice flour? Also, the chickpea flour is same as gram flour used mostly in Indian cooking? Hi Noori, sorghum flour could be a substitute for rice flour. And yes, chickpea flour/gram flour/garbanzo bean flour is all the same. I made this tonight, cooked the chickpea base for 6 minutes and it was quite thick. But when I took it out after 30 minutes the top was cooked but the inside was completely liquid! Any ideas why? That’s weird. Did you squeeze out the water from the veggies? Hello thank you for the recipe. Could you tell me how many calories ? Hi, Can I sub all-purpose flour or whole wheat flour instead of gluten-free for the crust? HI Ela! Just wondering at what temperature and for how long you would recommend putting it in the oven to warm up?? Trying it out this weekend for a family gathering! Hi, Ella. Thanks for the great recipe. I used the exact same ingredients you did for the crust but it was super hard to roll out — it kept breaking apart, cracking at the edges. And there was no hope to move it from the rolling surface to the pan, so I had to roll it on some foil and bake it with the foil underneath, between the crust and the pan. What could have been the issue? Is it lack of moisture or too much moisture? I experimented with adding water for a more moist crust but it kept on cracking. I am baking at high altitude, could that have something to do with it, in that there is very little moisture in the air and the dough cracks easily? Thanks! Hi Paula! It sounds like a lack of moisture. I actually live close to the ocean and it’s always very humid here. Wow, I never thought it could make such a huge difference, to be honest! This is so very good! Is there any chance you know about how much calories/slice? I agree to be informed about new recipes via email. An opt-out is possible at any time.